1. The HURRICANE HITTING MACHINE makes home practice so fun, entertaining, convenient, and productive that it is called the "Backyard Basketball Goal For Batters"! The reason for this "nickname" is that baseball and softball players love to hit as much as basketball players love to shoot. Having a hitting station in your yard 24-7 allows a player to hit or practice on "impulse" when he is bored and looking for something to do. Wouldn't you rather that your player swing the bat than play "Game Box", play "Horse" or watch TV? The truth is that the average youth player ,with average height and body build, is much more likely to play high school baseball than high school basketball because baseball involves a larger number of players than basketball. So shouldn't you make sure that your player spends as much time as possible swinging a bat? The Hurricane does just that! 2. The HURRICANE HITTING MACHINE allows your son or daughter to practice under your watchful eyes and to practice alone when you are at work or out of town. How many times has your son asked you to go outside to throw or pitch, but you had other responsibilities that prevented you from doing so? 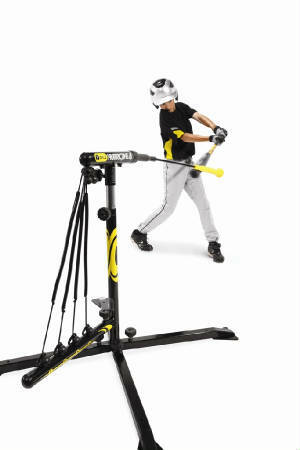 Now, your player can hit or practice alone without your help with the Hurricane Hitting Machine. 3. The HURRICANE HITTING MACHINE can be used indoors or outdoors and it makes a perfect year-round hitting station in your home or backyard. The HURRICANE HITTING MACHINE can easily give your player thousands and thousands of more practice swings each year! If you want your player to compete with other kids in the league, you must find a way to get as many practice swings as possible. The competition is tougher than ever because everyone practices and plays almost year round. Buy a Hurricane and give your player an edge over the competition! You will glad you did when your player becomes one of the team's or league's best hitters! With the purchase of a HURRICANE HITTING MACHINE that goal could be reached! 4. The HURRICANE HITTING MACHINE has height and speed adjustments for all ages and skill levels from Tee-ball to the college ranks. 5. The HURRICANE HITTING MACHINE's patented design gives the batter instant feedback as to the power and quality of every practice swing. The player immediately knows if a line drive, ground ball or fly ball was hit. This instant feedback is extremely useful for rapid skill and bat speed development! The Hurricane is well known and respected for developing a powerful line-drive swing! 6. The HURRICANE HITTING MACHINE is fully self-contained and requires no outside power source. The HURRICANE HITTING MACHINE's power source is its patented powerband system. This allows you to use it anywhere with ample space. Set it up at practice, before games or between games! It is a super pregame warmup! 7. The HURRICANE HITTING MACHINE is 100% Guaranteed to improve hitting skill and increase bat speed. The HURRICANE HITTING MACHINE carries a money back guarantee. HURRICANE HITTING MACHINE parts may be purchased if needed. What more could you ask for? Now you see why the Hurricane is one of the best selling training machines ever! It is one of the most popular trainers ever introduced to the marketplace! 8. The HURRICANE HITTING MACHINE has a travel weight of just over 30 pounds and it comes with a heavy-duty carrying bag. It fits easily into the trunk of even the compact automobile. 9. The HURRICANE HITTING MACHINE closely simulates real hitting conditions. The ball's large path of movement and speed of movement requires the hitter to really concentrate. The HURRICANE HITTING MACHINE builds incredible levels of confidence, fast! 10. The HURRICANE HITTING MACHINE features heavy-duty steel construction and a weather-proof powder-coat metallic paint finish that is designed to withstand the elements in all climates. 11. The HURRICANE HITTING MACHINE's patented design allows righted-handed and left-handed batters to work out together without having to change or adjust the machine. A single player can easily practice "switch-hitting" without having to stop and adjust the machine. This makes the HURRICANE HITTING MACHINE especially useful and convenient for team workouts. 12. The HURRICANE HITTING MACHINE does not require nets, screens or any other form of ball containment. The ball is safely controlled at all times by the composite rod. 13. The HURRICANE HITTING MACHINE assembles in minutes without tools. A detailed and easy-to-follow owners manual is included with each machine. 14. Every HURRICANE HITTING MACHINE comes complete with a detailed and simple-to-follow drill manual. The manual full explains the purpose and procedures for each drill. The manual also conatins the popular "20 Minute Hitter's Workout" for the future prospect. A workout designed to improve every fundamental needed to become a successful hitter at any level of competition. Should you need help with a drill, our staff is eager to help you. Call toll free, 1-877-431-4487. 15. The HURRICANE HITTING MACHINE is the most energy efficient and productive batting trainer ever invented. If you can find a better training machine, I encourage you to buy it! Because I know that there is absolutely nothing better than the HURRICANE HITTING MACHINE. Why would I say that? Because I know that this amazing breakthrough in hitting technology is the absolutely best that money can buy! Nothing else even comes close!